We started off our Triassic series looking at the placodonts, a group of turtle-like marine reptiles. The placodonts existed solely during the Triassic years, becoming extincted at the end of the time period. The second group of creatures that shared Pangea with the first dinosaurs were the nothosaurs. The nothosaurs (temporal range: 245-213 Mya) were a group of marine reptiles that first appeared in the seas of the Early Triassic. They thrived throughout the Triassic time period but eventually became extinct at the Triassic/Jurassic boundary. Unlike the placodonts however, the nothosaurs were not completely lost following their extinction. The much more commonly known plesiosaurs (temporal range: 203-66 Mya) thrived throughout the Jurassic and Cretaceous eras and are believed to have evolved from the far more primitive nothosaurs, with whom they share a number of distinct characteristics. The order Nothosauroidea was created in 1889, when paleontologist Georg Baur classified the nothosaurs within the Sauropterygia (the group which also includes the plesiosaurs and the placodonts). It is believed that the nothosaurs would have lived their lives in a similar manner to those of modern-day seals, catching food in water but coming ashore on rocks and beaches. The nothosaurs averaged around 3 meters in length and were characterised by an elongated neck, body and tail. The limbs were paddle-like and webbed, which would have helped generate power when swimming. They sported an elongated, flattened head with nostrils situated just in front of the eyes. It is believed that the nothosaurs breathed air, needing to come up to the surface for oxygen when in the water. It has also been recently proven that nothosaurs would have used their limbs to scoop out the soft mud whilst floating along the sea floor, possibly in an attempt to disturb prey items hiding among the seabed. The diet of a nothosaur would have consisted mainly of fish, squid and shrimp which would have been snapped up between a pair of long jaws, equipped with sharp, outward-pointing teeth. Picture: Lariosaurus, a member of the nothosaur family. – Discovery: Henodus is the only known member of the henodontid family of placodonts. Fossils of Henodus have been discovered in Germany and the species was named by Friedrich von Huene in 1936. – Description: Henodus is the placodont which most resembles a modern day turtle in terms of looks. It had a single piece carapace which covered the entire body and stretched out almost covering the limbs entirely. This carapace was extremely tough; made up of a fusion of a large number of interlocking bony scutes, which were then covered by a layer of horn. The carapace of Henodus was fused to its spine, and was almost as wide as it was long. This oversized shell would have acted as the ultimate form of protection from marine predators, and it is likely that most Triassic predators would not have been able to fit the shell of a fully grown Henodus between their jaws. This shell however would have been a great hindrance when Henodus was on land, and coupled with its extremely weak limbs, it is thought that Henodus would have spent very little time on land. Henodus differed from other placodonts in that the mouth was broad and squared off instead of pointed. Researchers believed Henodus would have used its broad mouth to shovel through sediment to find buried shellfish, whilst other placodonts with pointed mouths were better suited to plucking shellfish from between rocks. Henodus is the only placodont thus far to be found in non-marine deposits, suggesting it may have lived in brackish or freshwater lagoons and this unique lifestyle may explain its different feeding style. 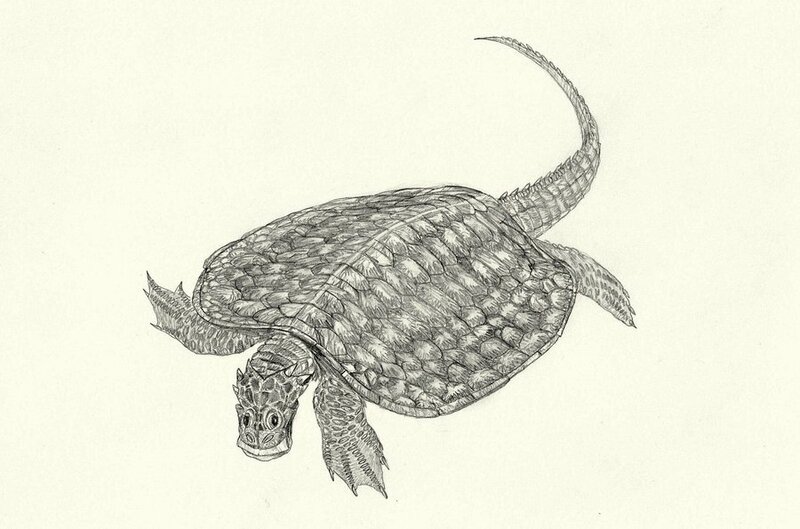 – Discovery: Placochelys is a member of the placochelyid family of placodonts. The first fossil specimen was recovered in 1902 from Hungary in Europe. Since then, a number of Placochelys fossils have been recovered from across central Europe, specifically from Germany, Austria and Italy. 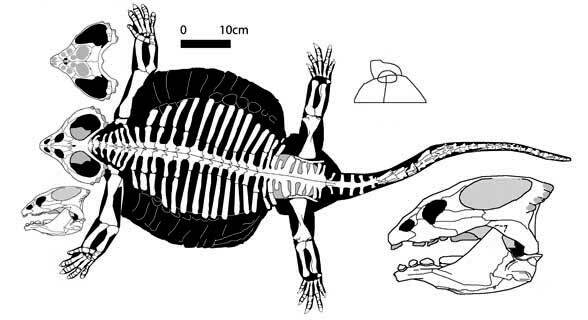 – Description: Placochelys was one of the smallest placodonts to have ever lived, with the largest recovered specimen measuring less than one metre in length. Of all the placodonts, Placochelys looked the most similar to the modern day sea turtle. It had a flat shell, smaller in size than the one found on Cyamodus. The shell itself was covered with a number of bony osteoderms and would have acted as a defence mechanism from predators. The skull of Placochelys was incredibly compact and robust. It is likely that the mouth was a predominantly toothless horny beak, lined with just a handful of specialised broad teeth. The animals jaw muscles were extremely strong, meaning Placochelys was extremely efficient at crushing shellfish. The limbs of Placochelys were paddled-shaped and would have been used to propel the animal through the water. However, unlike the modern sea turtle, Placochelys still had distinct toes. It also had a fairly short, stocky tail. – Discovery: Placodus is one of the best known and most commonly found of all the placodonts. It was named in 1833 by Swiss palaeontologist Louis Agassiz, who indecently thought the teeth he had first discovered belonged to a fish. It was not until 1858 when Richard Owen recognised that the teeth were in fact reptilian that Placodus was identified as a reptile. Since then, numerous fossils have been found in Germany, France, Poland and also China. 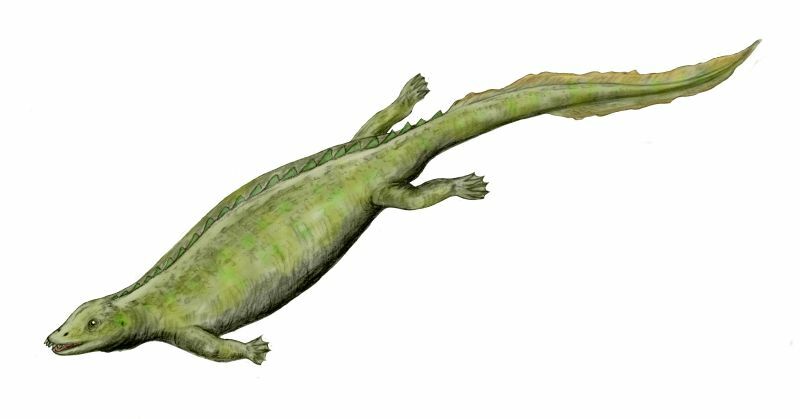 – Description: Like Paraplacodus, Placodus had a stocky body with a lengthy tail. It was also the largest of the known placondonts, growing to lengths of around three metres. Also like Paraplacodus, it had three forward-pointing teeth in each premaxilla but, unlike its close relative, these teeth were incredibly robust and the ends of each one were broad and rounded. The skull was particularly strong, developed so as to be able to cope with the stresses of crushing seashells. The vertebral processes of Placodus dove-tailed into each other and were firmly connected, creating an extremely rigid trunk. It also possessed a row of bony scutes along the top of its neural spines which likely would have given Placodus some form of defence from predators. Like Paraplacodus, Placodus was a negatively buoyant creature. Its large body and heavy bones mean it would have had no trouble staying on the seafloor to feed. – Discovery: A complete, disarticulated skeleton of Paraplacodus was discovered in Northern Italy and the species was subsequently named in 1931 by Bernard Peyer. The skeleton has not been worked on since 1942. 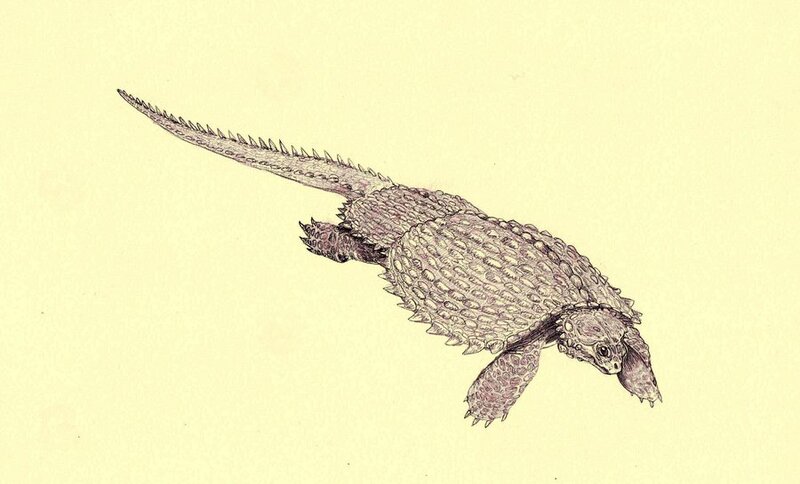 – Description: Paraplacodus belongs to the unarmoured group of placodonts, the placodontiods. Measuring 1.5 metres in length, it was medium sized and built like an oversized modern day newt. Its most distinctive feature were its teeth. It had three lengthened, forward-pointing teeth in each premaxilla and two corresponding elongated teeth in each dentary. These were then complimented by a number of rounded crushing teeth. These jaws were ideally designed for crushing shellfish and other marine crustaceans. Paraplacodus had thick ribs and each vertebrae included a long transverse process, creating an almost box-shaped torso. This square cross-section allowed Paraplacodus to remain close to the seabed whilst hunting for food. In addition, the forelimbs were notably short, yet fairly robust, and the hand was fairly small.